Seborrheic dermatitis is an inflammatory skin condition that tends to occur on the oily areas of the body, most noticeably on the face, scalp and chest. The rash usually appears as scaly skin with greasiness and yellow crusting that flakes off to reveal underlying redness and a flat or slightly raised plaque. Seborrheic dermatitis is a chronic condition that occurs for unknown reasons. There seems to be a link with abnormal immune responses and a certain type of yeast (fungus) that normally dwells on human skin. When it occurs on the scalp, it is commonly referred to as dandruff. However, the term dandruff may also be used to describe similar scalp conditions that differs in the disease mechanism and appearance to some extent. Seborrheic dermatitis can also affect newborn babies and the scalp presentation is usually referred to as cradle cap. It may also cause severe diaper rash. The term seborrheic dermatitis means inflamed skin (dermatitis) with excessive sebum or skin oil (seborrhea). However, the sebum production may not always be excessive. The sebaceous glands produce an oily substance known as sebum. Some areas of the body have more sebum than others, particularly the face, scalp and upper portion of the chest and even back. Throughout the skin on the body lives a number of different microorganisms like bacteria and fungi. These microorganisms do not cause any disease under normal circumstances and its population om the skin is carefully controlled. These microorganisms are referred to as the normal skin flora. One of these microorganisms is a group of yeasts, a type of fungus, known as Malassezia. For some reason that has not been clearly identified, the immune system reacts to the presence of these yeasts mainly on the more oily parts of the skin leading to inflammation of the skin. The population of the Malassezia yeast does not increase so it is not an overgrowth and it does penetrate the skin so it is not an infection. The quantity and composition of the sebum (skin oil) does not change either in most cases. Therefore the exact mechanism and interplay of factors that leads to seborrheic dermatitis is not fully understood. In fact Malassezia yeasts are not the only contributing factor to seborrheic dermatitis. The skin initially experiences inflammation where there is swelling between the superficial skin cells. The number of skin cells increase and there is thickening of the outer layers of the skin similar to another skin condition known as psoriasis. Mounds of the outer skin cells known as keratinocytes begin to develop containing certain types of immune cells and fluid. This is mainly seen around hair follicles where sebum is emptied to eventually rise up onto the skin surface. There is a yellowish crusting in the area and these lesions begin to scale and flake off with crusting at the area. Individual patches become apparent on the skin (macules or papules) with a swollen base that is red to yellow and greasy. The exact cause of seborrheic dermatitis is not known. The involvement of Malassezia fungi has been demonstrated with the improvement in the condition after the use of antifungal agents. It is important to note that the role of skin fungi is not a cause of seborrheic dermatitis but rather a contributing factor to the condition. Similarly other factors may also be involved. Seborrheic dermatitis occurs more frequently in Parkinson’s disease patients. This may be a result of the increased sebum production associated lower levels of dopamine in Parkinson’s disease. Seborrheic dermatitis may also be more frequently seen in other neurological disorders. However, not every case is associated with increased sebum as is seen in cases which are worse during winter where the skin tends to be dry. It is therefore more likely that seborrheic dermatitis is linked to some dysfunction in the normal barrier function of the skin. Psychological stress is believed to be a possible trigger and may also exacerbate existing seborrheic dermatitis. The mechanism may be associated with changes in sebum production although this is not always the case. Certain drugs, including those use in the treatment autoimmune diseases, psychiatric illness, skin diseases and anabolic steroids may increases the likelihood of seborrheic dermatitis. A genetic component has also been implicated as a possible risk factor. Seborrheic dermatitis is one of the most common skin conditions seen in HIV/AIDS and is believed to be due to the failure of the immune system to limit the growth of the Malassezia yeast. The presentation of seborrheic dermatitis can vary from mild to severe. The symptoms develop gradually and most commonly appears as mild scaling and flaking of skin on the scalp. The typical yellow crusting associated with seborrheic dermatitis may not always be present. Severe cases may also present with red plaques on the skin particularly on the face, head and chest. It is important to note that seborrheic dermatitis does not usually cause hair loss on the affected area. 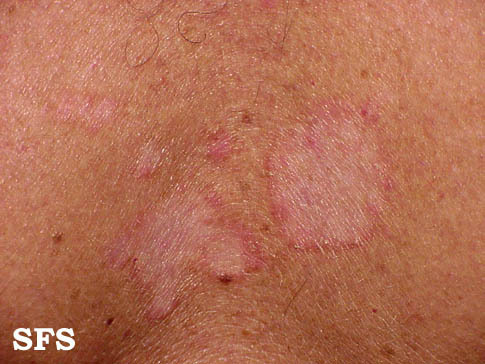 Picture of a seborrheic dermatitis rash with redness and raised borders. Sourced from Dermatology Atlas, courtesy of Samuel Freire da Silva, M.D. (www.atlasdermatologico.com.br). The scaling of the skin on the scalp is usually described as small cream to white flakes and commonly referred to as dandruff. Most cases of seborrheic dermatitis are seen after puberty and into adulthood. It may also occur in newborn babies. Dandruff in children is not often due to seborrheic dermatitis and more likely a result of tinea capitis (dermatophyte fungal infection of the scalp). Itching is usually mild to absent but varies among individuals. There are several other causes of an itchy scalp that also needs to be considered. The scaling may extend to the neck and behind the ears and in severe cases even into the ear canal. Various other types of rashes on the head, like scalp psoriasis, may appear similar to seborrheic dermatitis. Seborrheic dermatitis on the face is more likely with severe cases. 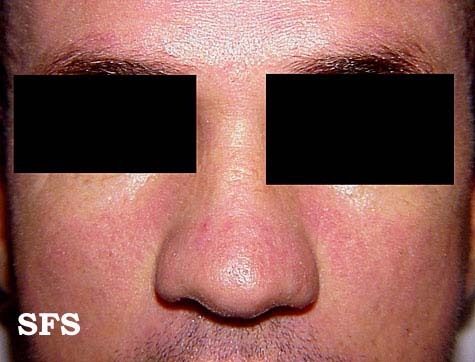 It is more likely to appear on the forehead, eyebrows, bridge of the nose and nasolabial folds (sides of the nose). Inflammation, scaling and crusting may also extend to the outer borders of the eyelids with involvement of the conjunctiva at times (conjunctivitis). The mustache and beard area may also be involved. Seborrheic dermatitis can also involve the chest, particularly over the sternum (breastbone), armpits (axillae), groin and scrotum in males continuing to the anogenital crease. These presentations are usually seen with more severe seborrheic dermatitis and the area typically appears red and swollen apart from the yellow crust and scaling skin. Seborrheic dermatitis in newborns has a thick yellow crust appearance particularly on the scalp. It is commonly referred to a cradle cap. There may also be severe diaper rash which is responds poorly to conventional measures. Picture of cradle cap. Sourced from Dermatology Atlas, courtesy of Samuel Freire da Silva, M.D. (www.atlasdermatologico.com.br). 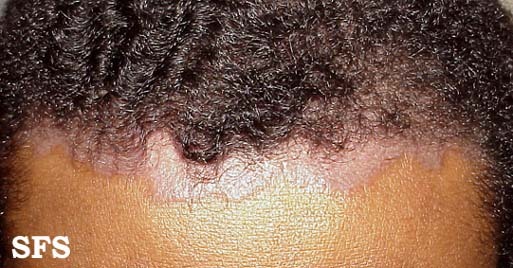 Picture of seborrheic dermatitis on the scalp of an adult extending to the hairline. Sourced from Dermatology Atlas, courtesy of Samuel Freire da Silva, M.D. (www.atlasdermatologico.com.br). 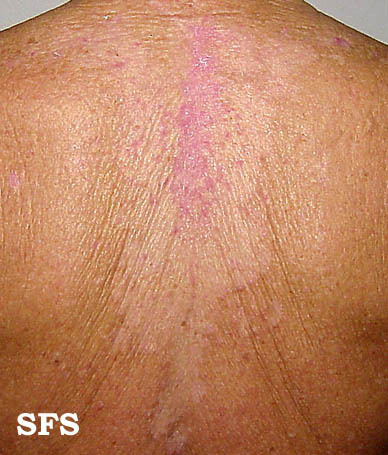 Picture of seborrheic dermatitis on the back. Sourced from Dermatology Atlas, courtesy of Samuel Freire da Silva, M.D. (www.atlasdermatologico.com.br). 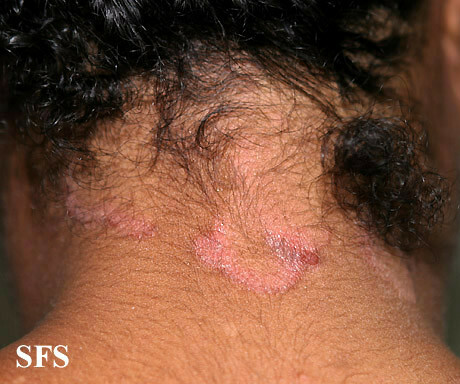 Picture of seborrheic dermatitis on the neck. Sourced from Dermatology Atlas, courtesy of Samuel Freire da Silva, M.D. (www.atlasdermatologico.com.br). Picture of seborrheic dermatitis on the face of an adult. Sourced from Dermatology Atlas, courtesy of Samuel Freire da Silva, M.D. (www.atlasdermatologico.com.br). 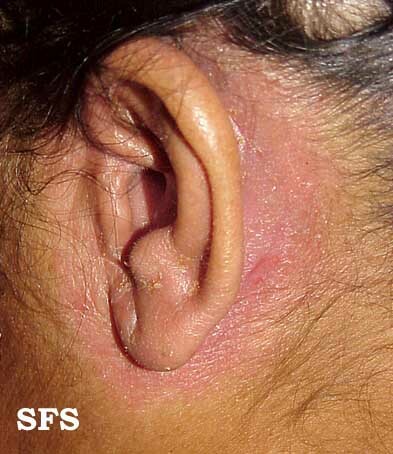 Picture of seborrheic dermatitis around the ear. Sourced from Dermatology Atlas, courtesy of Samuel Freire da Silva, M.D. (www.atlasdermatologico.com.br). 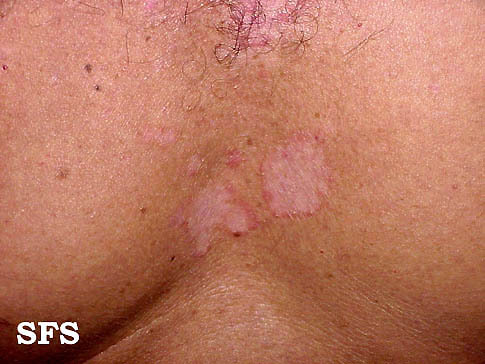 Picture of seborrheic dermatitis on the chest between the breasts. Sourced from Dermatology Atlas, courtesy of Samuel Freire da Silva, M.D. (www.atlasdermatologico.com.br). Topical agents like creams, lotions, ointments and shampoos are usually effective in the treatment of seborrheic dermatitis. Oral agents are rarely used. A corticosteroid lotion may also be applied onto the skin after bathing but should only be used until the redness and scaling subsides and the condition appears to be under control. Hydrocortisone creams may be used on other parts of the bod. Ketoconazole and other topical azoles may also be applied to treat the fungal component of seborrheic dermatitis. Oral antifungal agents are rarely prescribed and only considered in severe cases that are unresponsive to other measures. Diluted baby shampoo applied to the eyelids every night is usually sufficient to treat marginal blepharitis. Calcineurin inhibitors are only used after other treatments have failed to yield results but are associated with an increased risk of skin cancer. Treatment for babies should only be carried out as instructed by a doctor. The scalp is washed daily with baby shampoo. Hydrocortisone cream is applied twice daily. A corticosteroid gel may be applied to other affected areas and salicylic acid diluted in olive oil may also be prescribed as a topical application.